Popular talk show host Tucker Carlson is giving the thought police a taste of their own medicine. Television talk show host Tucker Carlson, one of the most popular cable news commentators on air today and a strong critic of globalism, mass immigration, forced multiculturalism, and other key tenets of the prevailing liberal, politically correct social order, has been targeted by radical left-wing groups and activists for months now. 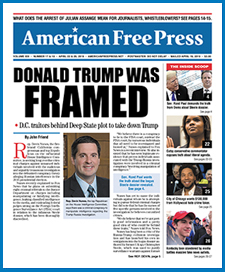 As this newspaper has previously reported, radical antifa activists targeted the outspoken America- first populist’s home in the Washington, D.C. area in November of last year. Several members of Smash Racism DC, a radical left-wing antifa-affiliated group, posted Carlson’s home address online and organized a protest outside his residence to denounce his alleged “racism” and “bigotry.” Others have organized boycotts of his program and have attempted to entice advertisers on both Fox News and Carlson’s flagship nightly news program, “Tucker Carlson Tonight,” to end their business relationship with the network. Media Matters, a highly partisan and far leftwing organization that regularly targets and attacks conservatives, has been and continues to be one of the primary organizations operating both behind the scenes and publicly to sabotage Carlson’s nightly news program and tarnish his reputation. The activist organization recently published and highlighted a number of controversial statements Carlson made years ago relating to women, minorities, and other topics in a dishonest effort to distort what Carlson actually meant and further tarnish his reputation. Carlson commendably did not back down in the face of such a dishonest and highly partisan smear campaign. Indeed, in response to the attacks, Carlson has used his platform to launch his own investigation into the dishonest left-wing groups and individuals that have so brazenly attacked him and Fox News in an effort to de-platform them and sabotage their reputations. In recent episodes of his nightly news program, Carlson has aired segments exposing the groups working tirelessly to end his career, including Media Matters, the Southern Poverty Law Center, and CNN, among others. Carlson recently revealed that the current president of Media Matters, Angelo Carusone, has a history of making derogatory and disparaging comments. Unsurprisingly, Carusone’s controversial statements have garnered little attention— or outrage—among Media Matters’s liberal supporters. Typically, these statements would have leftists worked up into a lather, working overtime to get the individual fired. The mainstream media would have reported heavily on the politically incorrect verbiage, interviewing top officials at the SPLC and other organizations, who would have condemned the speaker in no uncertain terms. A look at media reports reveals that only Fox News picked up the story, and Carusone remains the president of Media Matters. Countless conservatives and principled supporters of Carlson have rallied to his defense, expressing outrage at the increasingly tyrannical and dishonest tactics used by the radical left to silence and shut down their political rivals. “They’re a partisan hit squad trying to delegitimize and de-platform conservatives [. . .] Serious-minded people should understand this is political warfare and tell Media Matters to go pound sand,” Ryun stated. Christopher Cantwell, a libertarian-leaning podcaster and commentator, in a recent podcast praised Carlson’s resolve in refusing to bow down to Media Matters and the radical left. For now, Carlson and Fox News are not only holding out and refusing to bend to the pressure being brought by these dishonest outfits, they are actively fighting back against the left-wing outrage mob.